Sure, hundreds of thousands of attendees are already studying this year’s Coachella lineup and planning their festival looks, but L.A.’s gourmands know the real VIP of Indio’s two-weekend desert extravaganza: the food. 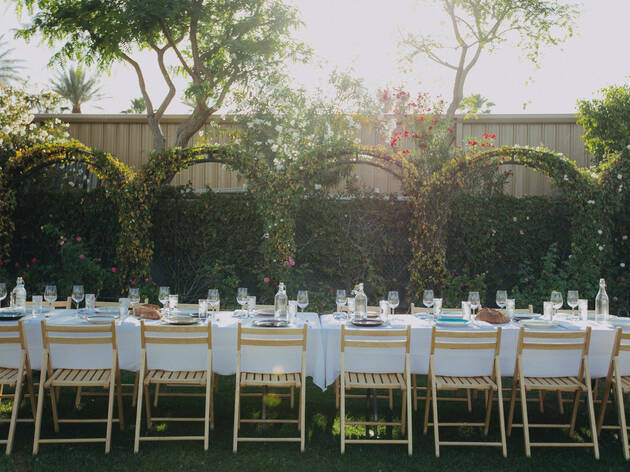 In addition to vendors who bring their best to the festival site itself, a handful of stellar Los Angeles chefs make the trek to cook at Coachella’s own iteration of the roving dinner series Outstanding in the Field. 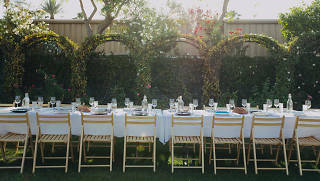 The ticketed dinners—at $225 per person—are quite possibly the best and most delicious way to upgrade a Coachella pass: Each ticket includes one-day-only entry to the VIP rose garden, where you’ll sip welcome cocktails, then feast on a four-course, family-style meal complete with beer and wine throughout the evening. To be clear, you’ll still need a festival pass to attend (and, FYI, both weekends are already sold out and currently waitlist-only); Outstanding in the Field is an additional charge on top of your regular Coachella tickets. Because a few of these dinners involve two or more chefs from separate restaurants, you can probably expect some once-in-a-lifetime collaborative dishes—or at very least, a once-in-a-lifetime menu. The Friday of the first weekend, April 12, look for a meal by Top Chef finalist Shirley Chung of Culver City’s new dumpling emporium Ms Chi Cafe, who joins a fellow Top Chef alumnus, Casey Thompson. The following night, on April 13, Native’s Nyesha Arrington—also of Top Chef fame—joins forces with Simone’s Jessica Largey for a meal that’s sure to feature some gorgeous seasonal produce. Closing out the first weekend is a trio from one of the city’s hottest new restaurants, Tartine Bianco/Manufactory: Elisabeth Prueitt, Katie Hagan-Whelchel and Leah Chin-Katz will take care of diners on April 14. Those hitting weekend two will spot Cal Mare’s famed Adam Sobel (formerly of Bourbon Steak) serving an alfresco feast on Friday night with L.A. son Ray Garcia of Broken Spanish and B.S. Taqueria—and whether there’s Sobel’s Coastal Italian cuisine, Garcia’s innovative Mexican fare or a blend of both, it seems like a winning combo. Saturday, April 20, Border Grill’s Susan Feniger and Mary Sue Milliken will no doubt be serving some of the modern Mexican flavor that’s made them local legends—and Julia Child Foundation honorees. Finally, on the last night of the fest, catch Jason Neroni—the pedigreed force behind Venice’s the Rose—whipping up something no doubt California-leaning and totally delicious. Coachella runs April 12-14 and the following weekend, April 19-21, at the Empire Polo Club in Indio. Outstanding in the Field is held in the VIP rose garden area. Correction: This post previously stated that Casey Thompson is also a chef of Ms Chi Cafe; the story has been updated to reflect that she is not.